Hey, this game ain’t so bad! 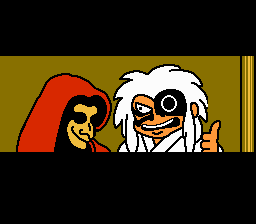 In terms of the series, it beats the hell out of part 2, but it can’t quite live up to the standard set by the arcadey genius of the original Kid Niki (FU! FU! FUUUUUU!). Few games ever actually HAVE lived up to this standard, however, so you can’t really hold Kid Niki 3 accountable for such a failure. I guess. 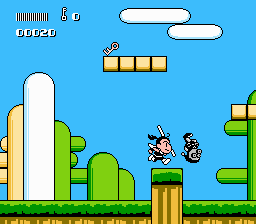 Even if you’ve never played a Kid Niki game before, though, you should still check this one out; at first, it appears to be your average multiscrolling collect-the-keys-and-hit-stuff platformer, but there’s a surprising (for an NES game) amount of gameplay variety to be found here. Aside from running around, jumping, and bonking stuff with your bonking stick, you can also slide, charge up for a spin attack, and hang off of walls and ledges, among other such feats. The control’s a little floaty, and the game itself seems to suffer from…like, some weird constant jerky glitchiness (Kid Niki 3 appears to be programmed by the same people who did all those terrible early NES arcade ports like Ghosts’n Goblins and Athena, if that’s any indication), but other than that, it’s a colorful, happy little gem of a game. You play now! Everything’s translated, including all text and graphics. Well, except for the note in the intro, but I don’t think anyone’s going to be confused as to what TASUKETE means (hint: your first guess is totally correct). 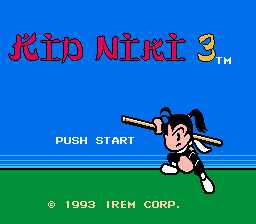 This patch also gets bonus cool points for staying true to the original Kid Niki’s bizarrely-translated wackiness. WILL HELP YOU! The archive above includes a readme, a manual, and two patches. Make sure you read the readme, since there’s a whole mess of mapper hacks and alternate versions of this rom floating around, and you need to figure out which one you have in order to know which patches to apply. Failure to heed the instructions within will result in the game completely flipping out and sending you into violent seizures. Seriously. You’ve been warned.